I enjoy comparing different bus types so this time I will compare the New Routemaster (NRM) with the Enviro400H City and the new Volvo SRM. The New Routemaster first entered service on Route 38 and since 2012 we have watched the fleet expand; it now serves over 20 routes in Central London. The Enviro400H City buses are serving route 78 and soon they will enter on route 26 under a new contract with CT Plus. Back in the middle of March 2016, Wrightbus and TfL unveiled the Volvo SRM which is a two-door New Routemaster bus, a design that enables bus companies to buy. I-SAM 600 volt ac permanent magnet water cooled electric motor mounted between engine and gearbox. *Depends on the laden weight of the vehicle which reduces capacity. Since the Son of Routemaster (SRM) was only recently unveiled, on the 16th March 2016, I do not have any more information on this specific bus type, but hopefully we may see more on the Wrightbus website soon. 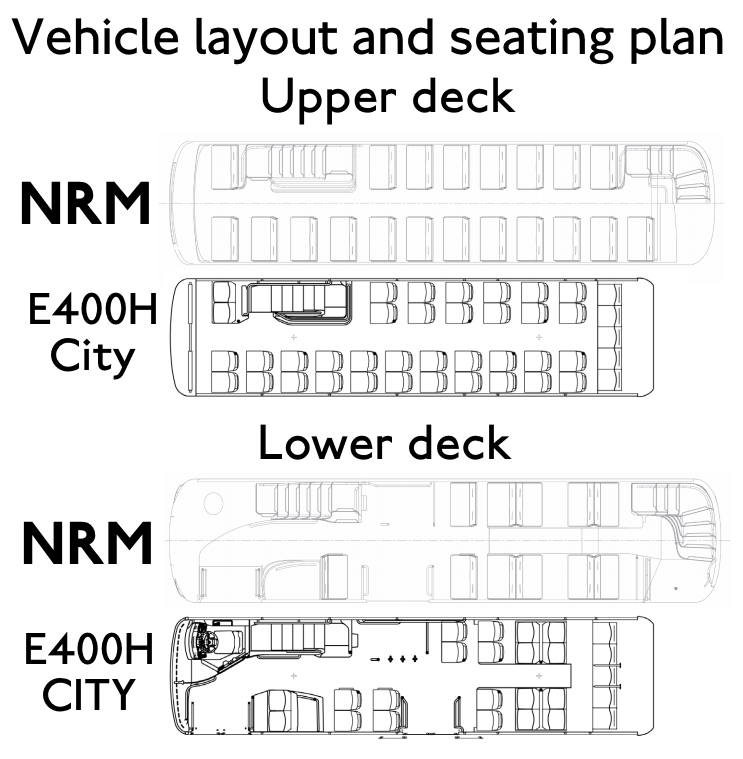 Here is the technical layout of the NRM and Enviro400H City. · Extra iBus display at the lower rear deck of the bus. · Very eye catching as its designed by Heatherwick Studios. · Brought by TFL which enables route conversions to commence fast. · Parts of the design is based on the Enviro200 MMC like the wrapover sky view window at the top rear deck. · Two doors for a standard boarding like with any average London bus. · Retains majority of the features based on the New Routemaster bus. All the buses I’ve mentioned have an iconic roundel at the front instead of a bus operating company logo. · Open boarding (3 doors 2 staircases) can cause fare evasion as we saw with the bendy buses. · The front seat of the lower deck faces to the rear. · There are no disadvantages of this bus in my view. · No rear window at the lower deck of the bus, compared to other bus types with Volvo B5LH chassis. What routes are they on? I do not have any more information regarding further route conversions. TFL is expecting to have 1,000 New Routemasters by the Summer of 2017. A shortened variant of the New Routemaster was built and unveiled in December 2015 but there are no news updates about the specific type. With the Enviro400H City, they are currently operating on route 78 which runs from Shoreditch to Nunhead. Arriva London owns 19 of the Enviro400H city buses. The next route to convert to the Enviro400H City is route 26; they are bought by CT Plus and are expecting to enter service on 25th June 2016. With the Volvo SRM, they will be introduced on to route 13 and a fleet of 6 have been purchased by RATP-Dev. They are expecting to enter service in September 2016. The reason why the New Routemaster was bought by TFL was because it increases savings for the bus operating companies as the value decreases over the years. Plus, the bus operators would have problems selling these buses on to the provincial bus services around Britain. As TFL leases the New Routemasters to operating companies, the operators have to pay a lease rental of £1 per bus, per year, for their contracted route. With the Enviro400H City and the Volvo SRM, they are bought by bus operating companies; the two doors and 1 staircase layout enables the bus to operate outside of London. Also, the bus operating company can convert their bus to single door which is widely used around Britain. The problem is it will take a while for a new route tender to come up, then when the bus operator wins/retains the route it's their decision to order the bus type required for their contract. Compared to the New Routemaster, both the Enviro400H City and the Volvo SRM have recieved little publicity in the mainstream media. This is because the New Routemaster has always been controversial. Since the successor to the New Routemaster has been designed and built, I hope that as time progresses we will be able to have a battery-electric double deck with SRM or Enviro400H City bodywork. This shows that London Bus designs are evolving as we see many new bus designs operating in London. I do like competing bus designs because it makes bus observations interesting for enthusiasts. The reasons why we should be moving onto zero emission buses is because the diesel emissions contribute to pollution and Climate Change. The technology is out there so we should take advantage of it. What do you think of the New Routemaster, Enviro400H City and the Volvo SRM? Let me know your thoughts in the comments section below. Please share this article because the two door design of the New Routemaster (Volvo SRM) deserves more publicity, the same goes for the Enviro400H City. No more Heatherwick designed buses for London? New Routemaster project now costs over £300 million, time for electric buses? TFL plans to extend New Routemaster fleet to 1,000! I love all 3 buses. I would love to see the SRM bus on my local route, the 264 route. I love the designs and I love to go on the New Routemaster bus. I wish more of these buses were in Croydon.